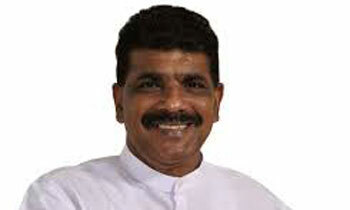 State Minister for Fishery and Aquatic Resource Development Dilip Wedaarachchi said yesterday that steps would be taken by the UNP to field a new candidate for the forthcoming Presidential Election and defeat the boasting Lotus flower bud (Pohottuwa). lol your only chance of hanging onto power is to field a common candidate at the next election too. Such is the state of your party at grassroots levels. VERY GOOD , Otherwise the UNP will get ONLY the Col . 7 votes . The best suitable , Young and energetic replacement is none other than SAJITH PREMADASA . No way UNP can win a another election for decades. Don't loose young voters on the Facebook issue. It will be disastrous. We have had enough of musical chairs. The voters should not be misled by these cosmetic changes. The UNP, the SLFP and the bud has shown they are all the same. Corrupt. We need a third force, that is not the JVP. It has to be a new party lead by a clean man or woman. I see an actor in the horizon. You may be correct.People seem to miss being assaulted and raped.